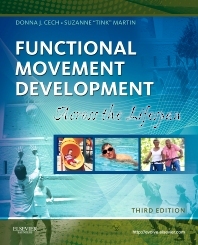 Providing a solid foundation in the normal development of functional movement, Functional Movement Development Across the Life Span, 3rd Edition helps you recognize and understand movement disorders and effectively manage patients with abnormal motor function. It begins with coverage of basic theory, motor development and motor control, and evaluation of function, then discusses the body systems contributing to functional movement, and defines functional movement outcomes in terms of age, vital functions, posture and balance, locomotion, prehension, and health and illness. This edition includes more clinical examples and applications, and updates data relating to typical performance on standardized tests of balance. Written by physical therapy experts Donna J. Cech and Suzanne "Tink" Martin, this book provides evidence-based information and tools you need to understand functional movement and manage patients' functional skills throughout the life span. Over 200 illustrations, tables, and special features clarify developmental concepts, address clinical implications, and summarize key points relating to clinical practice. A focus on evidence-based information covers development changes across the life span and how they impact function. A logical, easy-to-read format includes 15 chapters organized into three units covering basics, body systems, and age-related functional outcomes respectively.